Adjustable playable desk art. 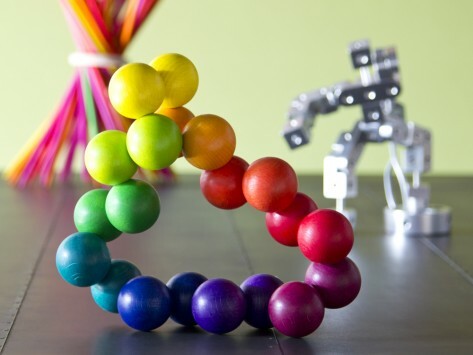 Specially designed lightweight wooden balls & connectors enable interconnected balls to be easily turned and twisted into your own creative designs. Comes packaged for gifting & display. Dimensions (in packaging): 8" x 8" x 2"
I sent this to my son-in-law, for his amusement and my granddaughters. They all loved it and thought it was fun! I purchased this as a gift. But when it arrived in the mail,I soooo wanted to take it out and play with it! I know they will love it! Go ahead, reach out and touch this work of art. It's every bit as fun to play with and visually appealing as it looks.